Our final night in Monterey, we again met up with L&T. Originally, they wanted to take us to dinner at a restaurant in Big Sur, but it was a foggy evening so the view would have not been good. 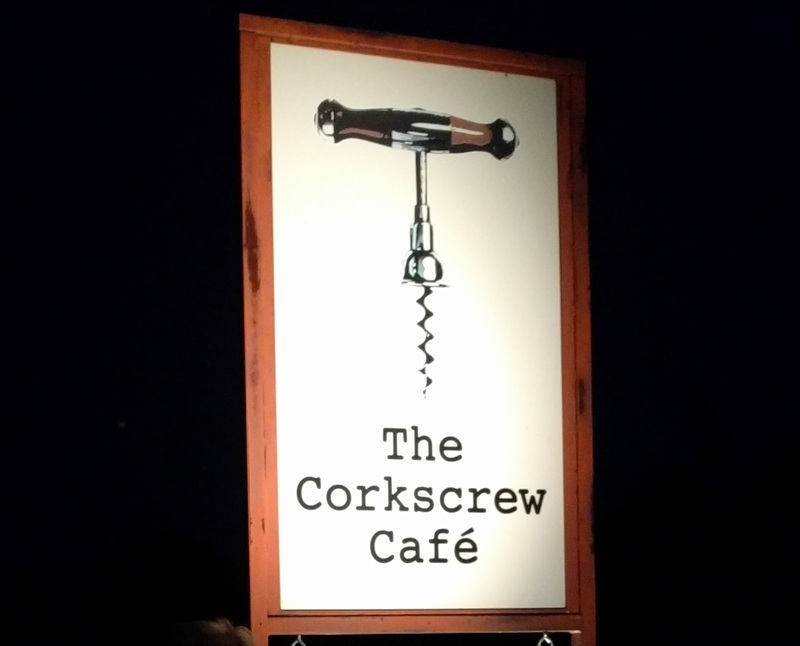 Instead, they took us to a place in the Carmel Valley: The Corkscrew Cafe. It's an adorable place. Quaint and cozy and welcoming inside plus an outdoor garden dining area with grapes hanging over your head and a water feature gurgling gently away. As usual, L opted for Stella Artois, T for tea, while SP & I enjoyed white wine. 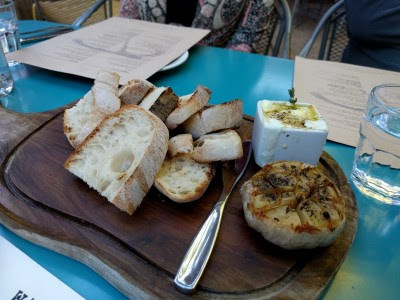 As we were seated, T ordered Whole Roasted Garlic (with Baked Goat Cheese & House Made Bread) to start. I don't think they know about my garlic sensitivity! The funny thing is, L wouldn't touch it, either! So it was up to T and SP to polish off the garlic, cheese, and bread, which they happily did. 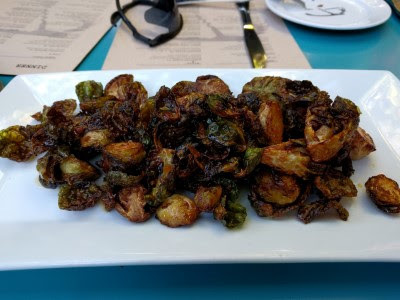 We also shared a starter of Brussels Sprouts (with spicy orange marmalade). These were yummy Brussels and I liked that instead of balsamic or cheese or maple, these were flavored with orange. It was really good, that sticky, sweet, citrus flavor on the Brussels. 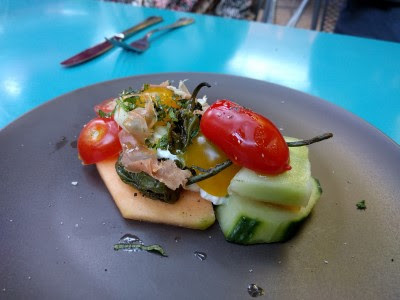 SP & I shared Heirloom Tomato Salad (melon, cucumber, prosciutto, burrata, charred padron). One of the best salads we've ever had. This was so darn good. Fresh, light, so much flavor. The menu isn't large and the entrees included veal, mussels, and salmon, all of which we enjoy, but somehow, we couldn't pass up the Meyer Lemon Wood Fired Pizza (Meyer lemon, prosciutto, arugula, mozzarella, parmesan). Wow. One of the best pizzas ever. 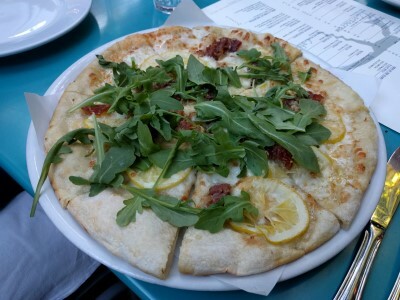 The lemon was such a nice flavor, not too tart, not overpowering, just such a nice bright flavor with the salty prosciutto, crunchy arugula, and cheeses. L&T both chose the Salmon (cauliflower, pink peppercorn potatoes, citrus chive emulsion). I didn't take a photo of their food but they both said it was delicious. They were a little sad the salmon pizza was no longer on the menu. The 4 of us shared 2 desserts. 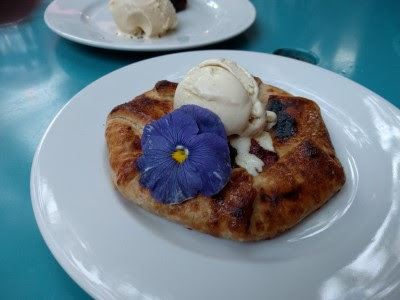 One was a Stonefruit Galette served with vanilla ice cream and the other was a Chocolate Cake served with vanilla ice cream. 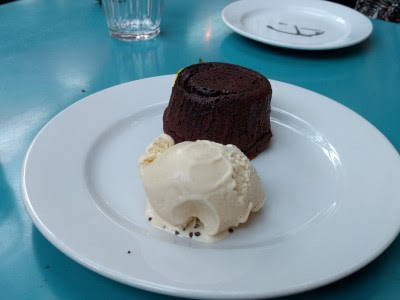 Both were delicious and quickly devoured. 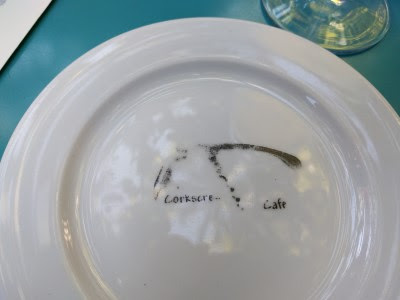 After dinner, as we were sitting around chatting, L asked us which meal of our 10 day trip was our favorite. We both named the same place: Corkscrew Cafe. He was surprised. 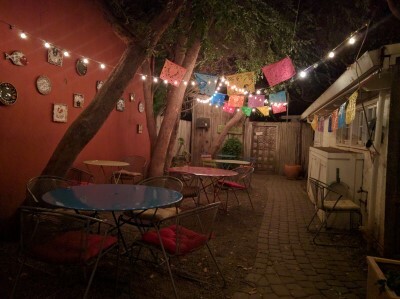 I think it was the lovely garden setting, the grapes hanging over our heads, the leisurely pace of dinner, a friendly server, great company, gorgeous summer evening - but also, the fresh, flavorful food. It was filling and satisfying and delicious and just the right portion sizes for us. We were left wanting more but not hungry, just that it was so tasty our taste buds cried out for more. We were full but not overly stuffed. We will definitely go back on our next trip to the area.